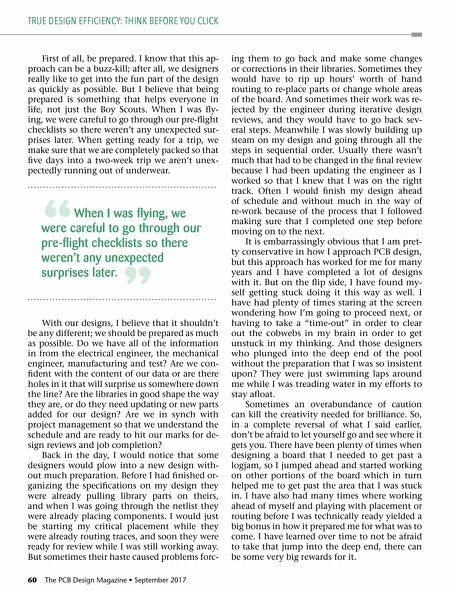 60 The PCB Design Magazine • September 2017 First of all, be prepared. I know that this ap- proach can be a buzz-kill; after all, we designers really like to get into the fun part of the design as quickly as possible. But I believe that being prepared is something that helps everyone in life, not just the Boy Scouts. When I was fly- ing, we were careful to go through our pre-flight checklists so there weren't any unexpected sur- prises later. When getting ready for a trip, we make sure that we are completely packed so that five days into a two-week trip we aren't unex- pectedly running out of underwear. With our designs, I believe that it shouldn't be any different; we should be prepared as much as possible. Do we have all of the information in from the electrical engineer, the mechanical engineer, manufacturing and test? Are we con- fident with the content of our data or are there holes in it that will surprise us somewhere down the line? Are the libraries in good shape the way they are, or do they need updating or new parts added for our design? Are we in synch with project management so that we understand the schedule and are ready to hit our marks for de- sign reviews and job completion? Back in the day, I would notice that some designers would plow into a new design with- out much preparation. Before I had finished or- ganizing the specifications on my design they were already pulling library parts on theirs, and when I was going through the netlist they were already placing components. I would just be starting my critical placement while they were already routing traces, and soon they were ready for review while I was still working away. But sometimes their haste caused problems forc- ing them to go back and make some changes or corrections in their libraries. Sometimes they would have to rip up hours' worth of hand routing to re-place parts or change whole areas of the board. And sometimes their work was re- jected by the engineer during iterative design reviews, and they would have to go back sev- eral steps. Meanwhile I was slowly building up steam on my design and going through all the steps in sequential order. Usually there wasn't much that had to be changed in the final review because I had been updating the engineer as I worked so that I knew that I was on the right track. Often I would finish my design ahead of schedule and without much in the way of re-work because of the process that I followed making sure that I completed one step before moving on to the next. 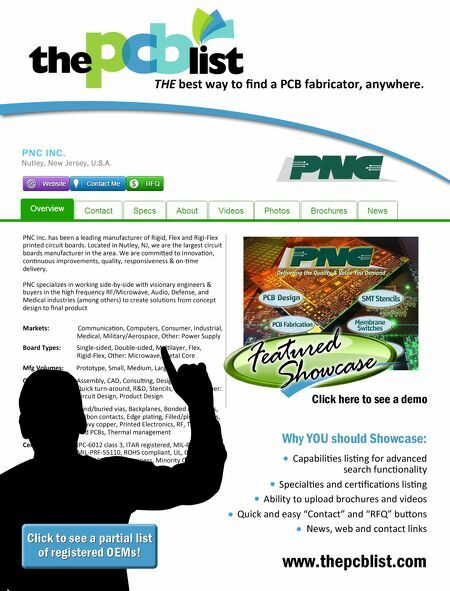 It is embarrassingly obvious that I am pret- ty conservative in how I approach PCB design, but this approach has worked for me for many years and I have completed a lot of designs with it. But on the flip side, I have found my- self getting stuck doing it this way as well. I have had plenty of times staring at the screen wondering how I'm going to proceed next, or having to take a "time-out" in order to clear out the cobwebs in my brain in order to get unstuck in my thinking. And those designers who plunged into the deep end of the pool without the preparation that I was so insistent upon? They were just swimming laps around me while I was treading water in my efforts to stay afloat. Sometimes an overabundance of caution can kill the creativity needed for brilliance. So, in a complete reversal of what I said earlier, don't be afraid to let yourself go and see where it gets you. There have been plenty of times when designing a board that I needed to get past a logjam, so I jumped ahead and started working on other portions of the board which in turn helped me to get past the area that I was stuck in. I have also had many times where working ahead of myself and playing with placement or routing before I was technically ready yielded a big bonus in how it prepared me for what was to come. I have learned over time to not be afraid to take that jump into the deep end, there can be some very big rewards for it. TRUE DESIGN EFFICIENCY: THINK BEFORE YOU CLICK " When I was flying, we were careful to go through our pre-flight checklists so there weren't any unexpected surprises later. "